It feels like the intro widget (with three images and text) should be a link to another page. As Intro Widgets is a widgetized area, you can go multiple ways to achieving this. That’s brilliant, thanks. And digging a bit deeper I can see visibility conditions too, which is more than brilliant. But, is it possible to have more than one version of the intro widget? I’d like to create “landing pages” within the website for different sections, and therefore, with different widgets. Widget visibility conditions comes from Jetpack plugin. 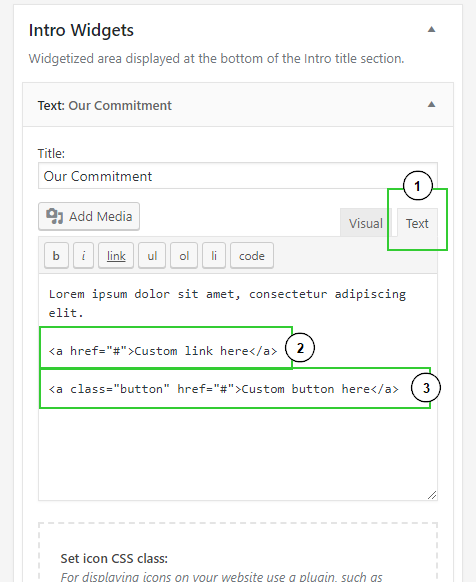 To replace whole widgetized areas use a sidebar management plugin. Please check the theme documentation – you will find the answers to most of your questions there. Especially helpful is the “Anatomy” section of the documentation.